Decorating the Christmas tree. Yippee! Sorry, everyone but I have to interrupt the tree decorating post for a special announcement. Remember I told you about Henderson Management donating a bunch of goodies for our Christmas packages? Well, they also host a Christmas party for children of their tenants every year and I attended. My mom works for them. 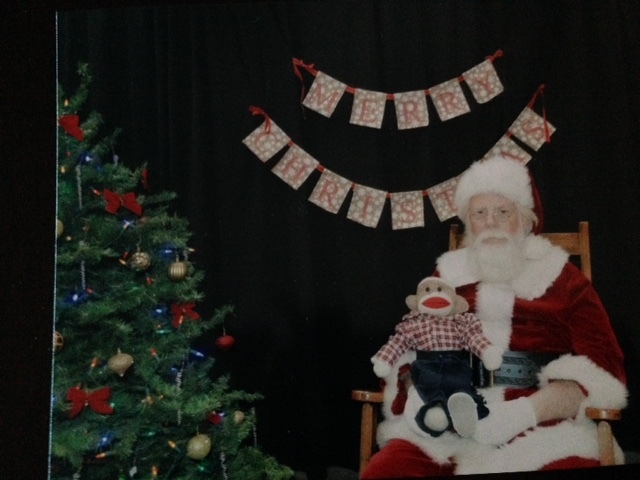 Anyway, she asked if I could get my picture taken with Santa and they said yes! I was SOOOO happy. Okay, back to decorating the Christmas tree. Like everyone else, I started with the lights. Obviously, that didn’t go so well. I was trying to untangle them when someone plugged them in. It startled me and I ended up in the middle of the tangled string of lights. It took quite a while for mom to get me untangled. 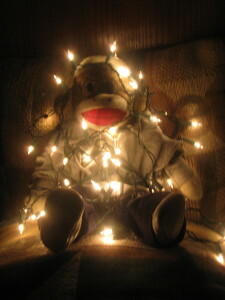 By the time they freed me and we got the lights on the tree, I needed a break. 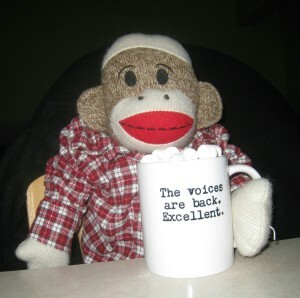 So, mom fixed me some hot cocoa. Mom’s the best. She even gave me extra marshmallows! Can you read the mug? We borrowed it from Sandra. It’s her favorite mug. My mom gave it to her as a gift one year because Sandra always says her characters talk to her until she writes their stories down. I like to use it once in a while in the hopes that characters will start talking to me and I can become a writer like Sandra. 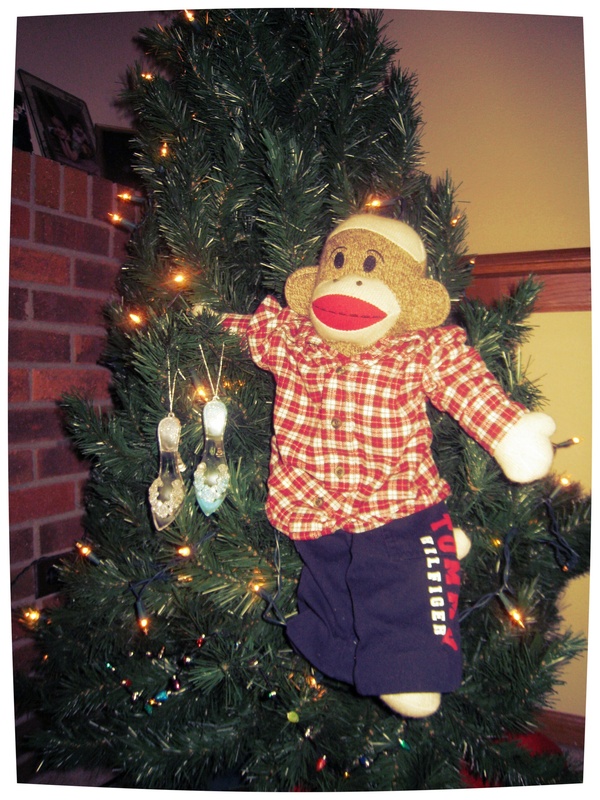 Okay, if you ha ve been following the countdown, you know I really decorated my tree earlier. You remember the picture with me hanging the shoes from the Mastering the Brides book on the tree? No? Here’s a picture of me with the shoes and other ornaments I wanted to put on the tree. It took some time to talk mom into putti ng shoes on the tree, but I pleaded my case (and maybe whined just a little) and she gave in. 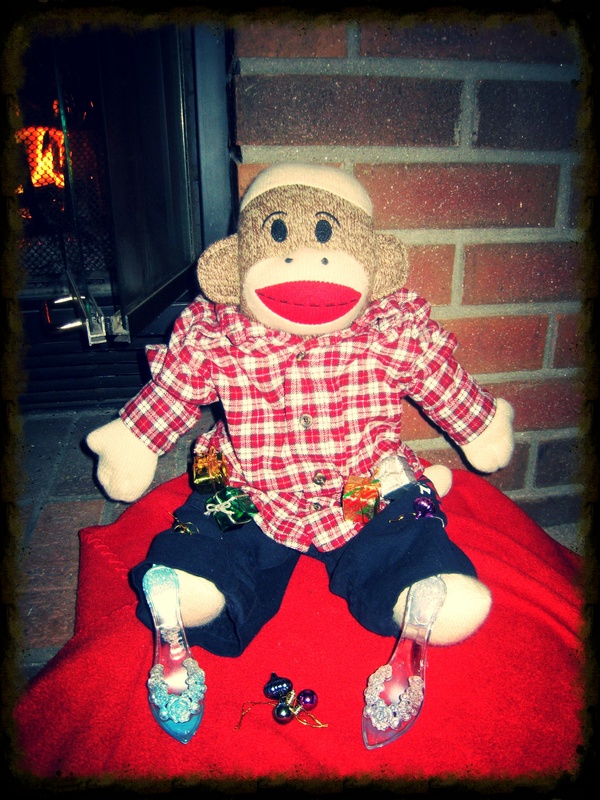 Next post I’ll show you some of the Christmas treats I made. So, do you have characters talking inside your head? Or, have you silenced them by writing their stories? Any Christmas stories? Until next time, this is SMJ signing off. Hey everyone, I just wanted to post this quick before I have to go run errands. I have a LOT of errands today, so I’ll post more later. At least, I hope to get back and post more later. I know, I said I’d post about decorating the tree I brought home yesterday, but I had something very important to do last night and I wanted to share that first. My ‘uncle’ Karl is floating out in one of the oceans somewhere with other U.S. sailors. I told Mom and Sandra thought it would be a great idea to send them some stuff. Mom told the people at her office at Henderson Management and they offered to help. I mean REALLY help. Look at everything they donated to our cause! I guess you can understand what I was doing last night. That’s right. I was boxing all this stuff up. I’m certain all the sailors will enjoy the treats. We also got a list of some military personnel and worked up cards to send. I had to pose for a bunch of pictures and then we picked out four of them for the card. I hope the people like them. 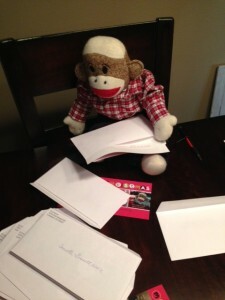 To the left you’ll see me addressing envelopes, oh and there’s a shot of the card, too. 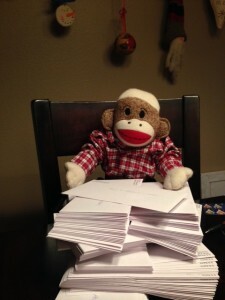 Do you have any idea how long it takes to address envelopes to almost 200 different people? I definitely had writer’s cramp after that endeavor, but it was worth it. I kno w the silly pictures of me will give a chuckle to a lot of folks who can’t be home with their families for Christmas. 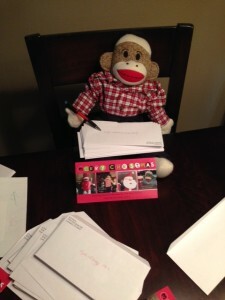 To the right, you’ll see me stuffing the cards into all those envelopes. It took more than one cup of cocoa to wash all the yucky taste off my tongue after sealing them. Then again, I’d do just about anything for a cup of cocoa, wouldn’t you? So, here’s the final pic for now. What do you think of that stack? Huh? Pretty good work, don’t you think? Okay, I’ll admit, Mom and Sandra helped a little. Well, now you can see why I’m getting a late start today. I slept in after all that work last night. One of the errands I have to run is trying to mail everything. Hopefully, the lines aren’t too long a nd the mail people won’t think I have too much to send. If they let me, I’ll post pictures of sending them off later. Have you sent cards or treats to some military personnel? Leave a comment letting me know so we can share the love all over!